Our family always has a great time celebrating New Year's Eve, especially with lots of wonderful appetizers to snack on throughout the night. 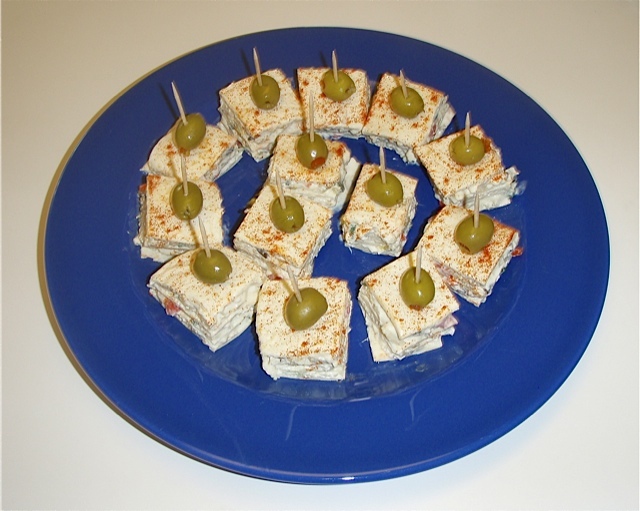 These Mexican Confetti Squares are the perfect low-point snack for any occasion. Enjoy! Mix sour cream and cream cheese in small bowl and beat at medium speed until combined. Stir in mozzarella cheese, pimentos, green onions, chiles, and olives. Spread 1/3 cup sour cream mixture over 1 tortilla. Top with another tortilla and spread with about 1/3 cup sour cream mixture. Repeat layering two more times ending with a tortilla. Wrap in plastic and place in refrigerator for at least 2 hours. Cut tortillas into 1-inch squares and sprinkle with paprika or chili powder. Garnish with a green olive if desired. If you'd like a printer-friendly version of this recipe, Click Here.